Following the transformation of Scylla into a rock, Aeneas is rowed through the Straits of Messina, forward in his epic voyage. Unlike his earlier rival Virgil, Ovid again skips through those adventures in outline. appearing unlike men, although like men. their bodies with long yellow ugly hair. and their ill conduct in harsh jabbering. Once again trending north-west along the coast of Italy, they pass Naples, and on to the next story. The story of Dido and Aeneas, as told by Virgil, has been a major inspiration for every form of art from opera to sculpture. I here select some of the more interesting depictions which retain narrative strength. 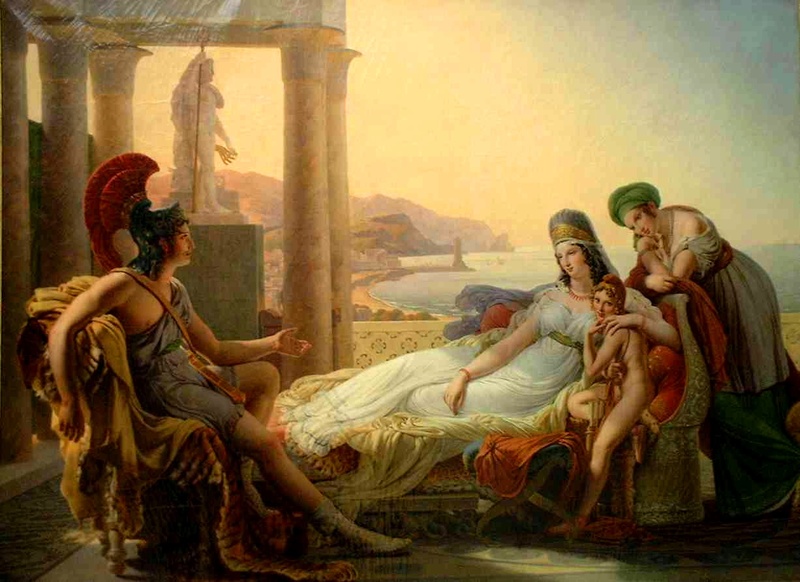 Pierre-Narcisse Guérin’s Aeneas tells Dido the misfortunes of the City of Troy, painted in about 1815, is probably the standard work showing the beginnings of the romance. Unfortunately it doesn’t give any clues – such as the presence of Aeneas’ ships – to its tragic outcome. The diminutive beauty being embraced by Dido is probably not intended to be human, and unlikely to be Juno or Venus who acted together to make the love affair happen. Jeanne Huet was apparently Guérin’s model for Dido: she may have been the older sister of painter Paul Huet, later one of Guérin’s pupils. You may be surprised to see an early watercolour sketch by Cézanne in this series. 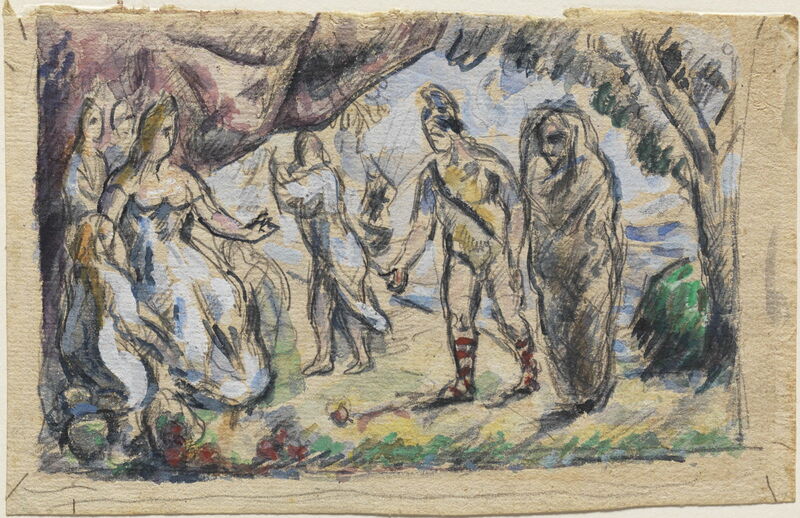 In about 1875, when he was still experimenting with narrative genres, Cézanne first drew a compositional study, then painted Aeneas Meeting Dido at Carthage. Queen Dido is at the left, surrounded by her court. The warrior figure of Aeneas stands to the right of centre, and to the right of him is the shrouded spectre of Aeneas’ wife, Creusa, who was abandoned by Aeneas as the family fled the burning city of Troy. This refers quite faithfully to Virgil’s account, as Aeneas describes searching for Creusa in his series of misfortunes. However, Ovid omits any mention of her disappearance or death. Giovanni Battista Tiepolo (1696–1770), The Death of Dido (1757-70), oil, 40 x 63 cm, Pushkin Museum Музей изобразительных искусств им. А.С. Пушкина, Moscow, Russia. Wikimedia Commons. 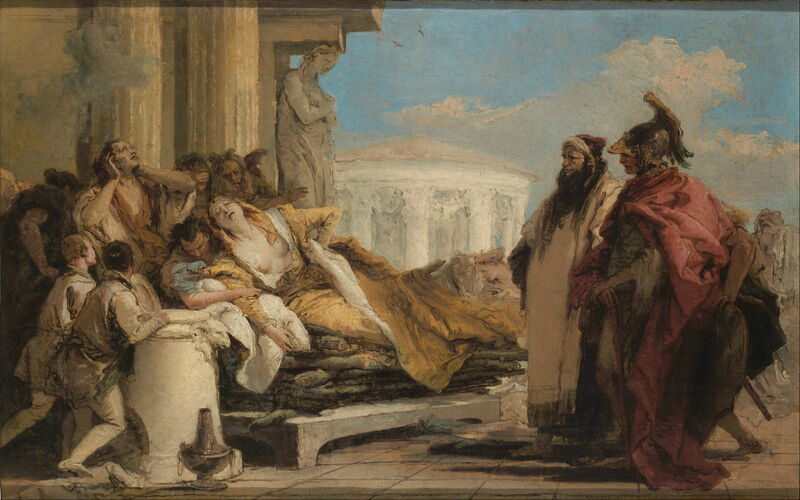 Normally titled The Death of Dido, Tiepolo’s painting from 1757-70 shows an odd composite scene in which Aeneas, packed and ready to sail with his ship, watches on as Dido suffers the agony of their separation, lying on the bed of her funeral pyre. A portentous puff of black smoke has just risen to the left, although it is surely far too early for anyone to think of setting the timbers alight. 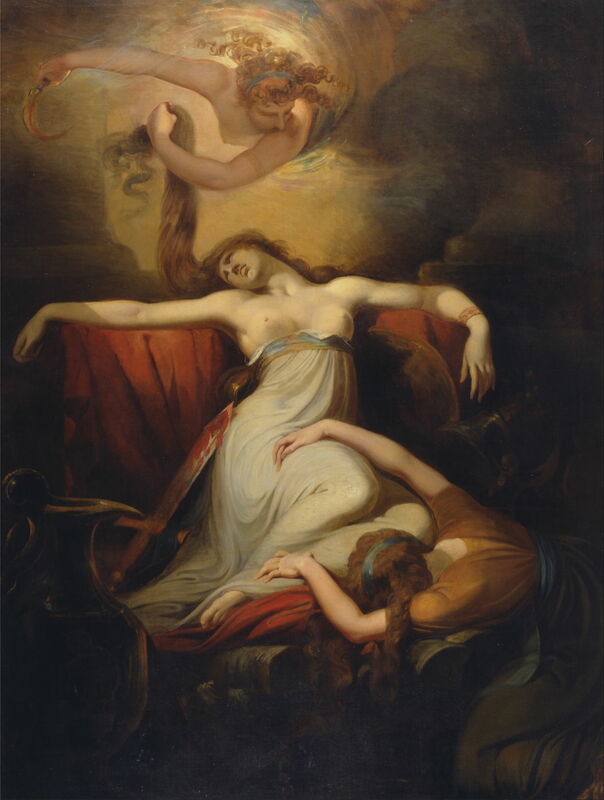 My favourite painting of Dido’s spectacular death is probably the only conventional history painting ever made by Henry Fuseli, known simply as Dido (1781). Book IV of Virgil’s Aeneid, in which this story is told in full detail, was the first work of classical literature which I studied as a set book, so I have a particular affection for Fuseli’s meticulously faithful account, which shows the scene around line 666. Dido has just been abandoned by Aeneas, has mounted her funeral pyre, and is on the couch on which she and Aeneas made love. She then falls on a sword which Aeneas had given her, and that rests, covered with her blood, beside her, its tip pointing up towards her right breast. Her sister Anna rushes in to embrace her during her dying moments, and Jupiter sends Iris (shown above, wielding a golden sickle) to release Dido’s spirit from her body. Already smoke seems to be rising up from the pyre, which will confirm visually to Aeneas that she has killed herself, as he sails away from Carthage. Ovid’s interest in the origins of apes, from transformation of the Cercopes, has not been reflected in the arts. Antonio Tempesta (1555-1630), Jupiter Changing the Cercopians into Monkeys (date not known), etching in series Ovid’s Metamorphoses, plate 132, 10.1 x 11.8 cm, Fine Arts Museums of San Francisco (Mr. and Mrs. Marcus Sopher Collection), San Francisco, CA. Courtesy of the Fine Arts Museums of San Francisco. It has been shown only by those like Antonio Tempesta who engraved for illustrated editions of the Metamorphoses. 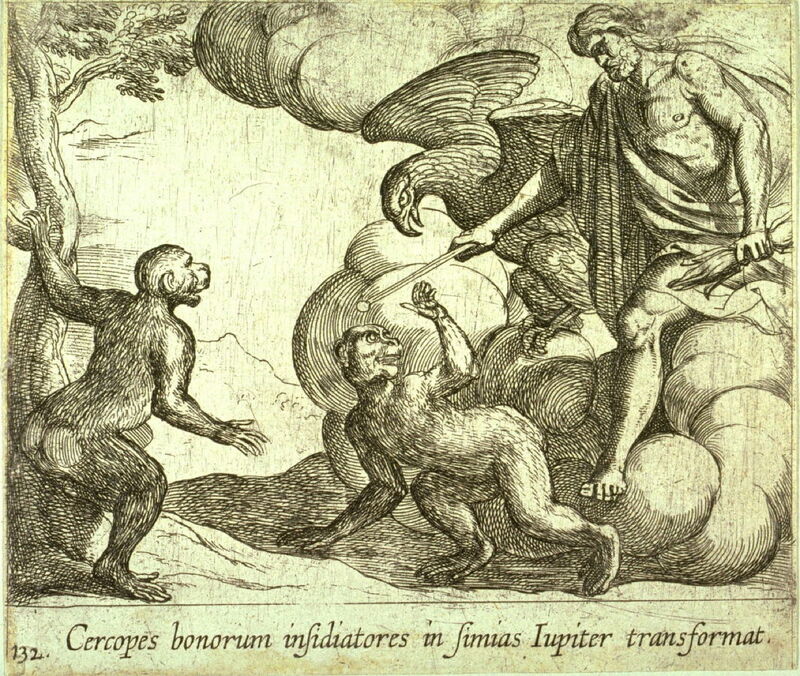 Tempesta’s Jupiter Changing the Cercopians into Monkeys from around 1600 shows Jupiter at the right, accompanied as ever by his huge eagle, with the transformed monkeys. Posted in General, Language, Life, Painting and tagged Cézanne, Fuseli, Guérin, Metamorphoses, myth, narrative, Ovid, painting, Tempesta, Tiepolo. Bookmark the permalink.